The list of dividend aristocrats, dividend achievers, or dividend champion is favorite hunting ground most of the dividend focused investors. This list includes companies from S&P500 index or S&P1500 index that have been continuously raising dividends last 25 years or 10 years or more. In general, these are companies that are listed on US markets. The list of companies (and dividend opportunities) will keep churning. It is really difficult to predict which ones will continue to survive for another 10 years or more. As they age, it will be harder for them to sustain their dividend growth momentum. The likelihood of their ability to grow dividend will continue to diminish. We need to understand dividend growth in the context of growth in US economy. Dividend growth is only possible on the back of growth in corporate earnings. Keeping with the growth of US economy, many of these companies also continued to grow and hence dividends kept increasing. However, investors cannot ignore the current US economy vis-à-vis emerging market economies. The chart below shows earnings trends (published on Business Week) for US companies from 1948 to mid 2009. 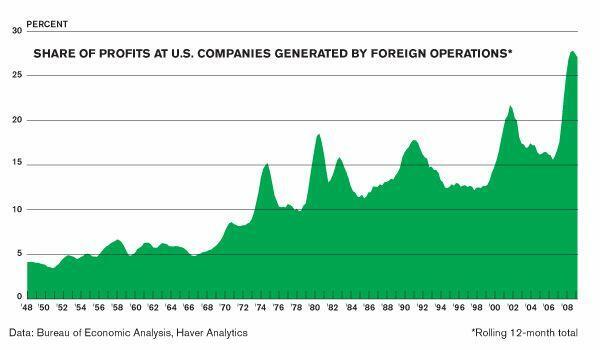 Over the last sixty years, the percentage of profits from foreign operations keeps increasing. In year 2009, these earnings have reached up to 25% of the total profits. For now, this 25% of total profits may appear as not a significant level, but it is the trend (or growth) that we need to keep in our focus. 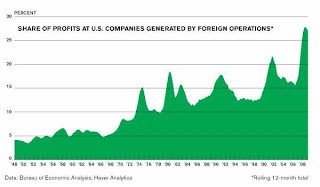 In addition, there are quite a few US multinationals that are doing well and positioned to continue their growth in developed economies and emerging economies. While the chart above shows overall profits of US companies, following are few dividend companies that generate revenues (and hence earnings) from emerging markets. Majority these companies have paid growing dividends in last five years as measured in their native currency. It is for this reason I view these multinational companies are potential opportunities for divined growth, hedge against dollar fluctuations, and proxy for emerging markets. Investors can expect companies on this list to provide dividends for relatively longer term.